The Lenovo Tab 4 10 Plus is one of the few new tablets that doesn’t just scrape together minimal specs in an attempt to attract buyers who find the iPad a bit too expensive. It’s only slightly less expensive than Apple’s entry-level new iPad, and that has more storage too. Factor this in and they’re similarly-priced. As with most Android tablets, the Lenovo Tab 4 10 Plus's design doesn’t quite match an iPad’s. However, if you’re resolutely an Android lover, this is one of the few good mid-price options you have. Highlights include a screen that's great for comic books and movies, GPS and expandable memory. It’s also half the price of the Samsung Galaxy Tab S3, although the older 8-inch Galaxy Tab S2 is still around and may be more compelling if you don’t mind an 8-inch screen rather than a 10-inch one. There’s surprisingly little direct competition for the Lenovo Tab 4 10 Plus on the Android front, most likely because the audience for a large, mid-range tablet like this is small. It starts at $279/£299 (around AU$350) for the 16GB version, rising to £349 (roughly $470/AU$590) in the UK for a model with 64GB of storage. 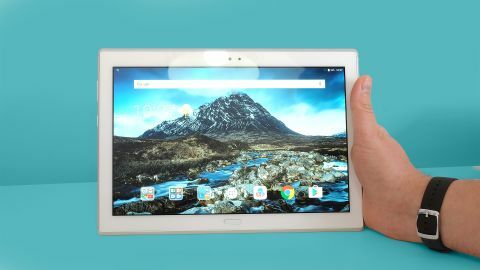 Don’t confuse these with the non “Plus” Tab 4 tablets, which are significantly cheaper, but have much lower resolution screens and less powerful chipsets. The best lower-cost alternative doesn’t come from Lenovo, though. The Amazon Fire HD 10 (2017) is half the price. Its chipset is less powerful, the cameras much worse and the software won’t please all. But as it has one crucial element, a 1,200 x 1,920 screen, it’s a very attractive alternative for those on a budget. The Lenovo Tab 4 10 Plus represents a step up from most Android tablets we see on shelves these days. Buy a sub-$250/£200/AU$300 10-inch tablet and it may well have a screen with fewer pixels than a 5-inch phone. Seems a bit wrong, doesn’t it? A 1,200 x 1,920 display makes the Lenovo Tab 4 10 Plus much better for games, movies, digital comics and for reading articles than those tablets. iPads are sharper still, but the leap from a ‘bad’ resolution to a ‘good’ one is the main thing. The Lenovo Tab 4 10 Plus also has the same chipset you’ll see in some mid-range phones, including the Moto G5S Plus and Xiaomi Mi Max 2. It’s the Qualcomm Snapdragon 625. As is often the case, if you have a good phone its cameras will be better than the Lenovo Tab 4 10 Plus’s. But photo quality is also a lot better than that of ultra-budget tablets. This is a solid slate, all-round. Long-term tablet users like us are likely to be stultified by the lack of progress, though. In some ways the Nexus 10, a tablet released five years ago, doesn’t seem that far behind a new tablet like this, and actually beats the Lenovo Tab 4 10 Plus for screen resolution. While we’d be happy to use this as our main tablet, it’s a good clue as to why not many people buy new tablets these days. The Lenovo Tab 4 10 Plus has a high-quality design, if not quite one with the same level of finish as an iPad. Its front and back are glass, the sides (when held landscape) are mostly metal. However, the top and bottom edges are plastic, as is a 1mm border around the other sides. The visual and tactile impression left is of a high-quality “non-budget” tablet, but not quite a flawless, pristine one. You’ll have to decide whether this matters. 10-inch tablet design also hasn’t really developed much since 2013/2014. Unlike some of the latest phones, the Lenovo Tab 4 10 Plus still has fairly chunky screen surrounds. Front on it looks a little like the Samsung Galaxy Note 10.1 (2014), a tablet that would still hold up well today if its software wasn’t woefully out of date. The Lenovo Tab 4 10 Plus is a rather non-trendy shape, with a 16:10 screen intended for landscape orientation use. Samsung’s Tab S series switched to a more iPad-like aspect several years ago. The Lenovo's shape is more awkward and seems larger relative to the screen inch count, but is still a great design for a tablet you’ll use more, say, on the sofa than sat on a train seat. At 7mm thick and 475g it’s among the smaller, lighter 10-inch models. It’s significantly thinner than the new Amazon Fire HD 10 (2017), for example, whose tough plastic casing is 9.8mm thick. Every part of the Lenovo Tab 4 10 Plus design tells you it’s intended for landscape use: the side button placement, the position of the front camera and fingerprint scanner. As usual, you use the finger scanner to bring the tablet out of sleep without a password. While fairly quick it’s not the most reliable scanner, at times taking a couple of attempts to work. You can avoid this with more careful prodding. And as you won’t need to use it anywhere near as much as a phone scanner, it doesn’t matter all that much anyway. You get 16GB or 64GB of storage with the Lenovo Tab 4 10 Plus depending on the version bought, and it has a microSD tray on the side. It lives under the Lenovo logo, which is actually a removable flap. In some territories there are 4G LTE versions of the Tab 4 10 Plus too, although our sample only has space for a memory card. The Lenovo Tab 4 10 Plus has a 10.1-inch 1,200 x 1,920 IPS LCD screen. This is perhaps the most important part of the tablet, the element that separates it from most much cheaper models. Many budget 10-inch tablets have 800 x 1,280 screens, with a pixel density so low that font characters appear blocky or grainy. The new iPad and Samsung Galaxy Tab S3 are sharper still: look closely and you’ll see some light pixelation here. However, it’s sharp enough to comfortably read from. Color is punchy and contrast is good. It needs a slightly higher pixel density to be considered a world class display, but is otherwise not too far off when viewed indoors. From using the Lenovo Tab 4 10 Plus at home we were a little worried it’d struggle outside as it doesn’t initially appear to have the intense brightness of Samsung’s Super AMOLED panels. To test it out we took it out on a bright autumn day to the park. We were pleasantly surprised by how well it fared. No squinting needed: the image was still very clear. There’s even a special mode in Settings designed to combat bright environments. However, switching it on and off we couldn’t actually tell the difference.